Slide Warmers | Microscopes America, Inc.
Our Slide Warmers come in multiple sizes to preserve as many microscope slide samples as you need at one time. Specialized surfaces ensure even heat distribution for every slide, and easy-to-operate controls enable you to set the temperature based on your needs. Order a Slide Warmer today for your Biology, Medical, or General Science Laboratory to keep samples fresh for optimal viewing and analysis. 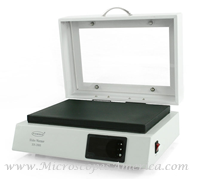 Large thermal warmer for microscope slides. 25" x 8" Surface holds approx. Ideal for use in the fields of cytology, histology, pathology, and biology for paraffin tissue section mounting. Thermal heater ensures even heat transfer. Anodized black surface provides contrast. LED temperature display. Size 25" x 8"
• Free Shipping within the continental United States. Small thermal warmer for microscope slides. 10¼” x 7” (26cm x 18cm) Surface. XH-2001 and XH-2002 Slide Warmers are ideal for use in the fields of cytology, histology, pathology, and biology for paraffin tissue section mounting. The thermostat can be set from room temperature to 70Â°C, and the temperature is shown on an LED temperature display. • Size: 10" x 7"
• International, overseas buyers, please contact us for an overseas quote. Small footprint. Easy slide pick up: Edge for slide not on surface. Our Step Up™ Slide Warmer XH-2003 helps you save space while still meeting a busy lab’s needs. Holds as many slides as our large XH-2001 with the addition of a lid/top. Slide Warmer, with Hinged Cover, Large 25"x 8" Surface. Ideal for use in the fields of cytology, histology, pathology, and biology for paraffin tissue section mounting. Thermal heater ensures even heat transfer. Anodized black surface provides contrast. LED temperature display. • Thermal heater ensures even heat transfer. • Anodized black surface provides contrast. Holds as many slides as our large XH-2002 with the addition of a lid/top. Ideal for use in the fields of cytology, histology, pathology, and biology for paraffin tissue section mounting. Thermal heater ensures even heat transfer. Anodized black surface provides contrast. Large special aluminum alloy surface. Perfect heat distribution across entire surface. Our new version has a special aluminum alloy surface plate for improved heat transfer providing for more even heat distribution along the entire surface. • Shipping Weight 27 lbs. Small. Special aluminum alloy surface. Perfect heat distribution across entire surface. • Shipping Weight 10 lbs.